We hold a shooting photograh at the Ryhotei Saami today. We had a such lovely weather. The entrance floor is made of stone pavements. 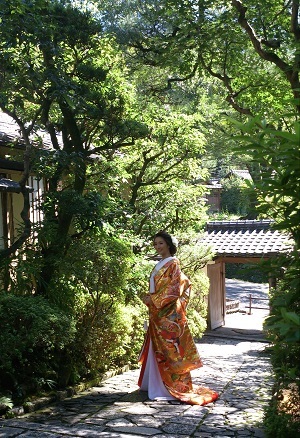 Ryotei Saami is a resturant which is particularly adapted for wedding costumes with such as kimono and wedding dress. The garden is full of tastes.The ryoteis atomosphere,the delicious kaiseki cuisine.Eveyone is fascinated by this surrounding.We had the pleasre to have supported this wedding this weekend.